Here is the rubric for January’s Monthly Ma’at ritual for anyone who is interested! Awake in peace, great gods, awake in peace. I come to you, your servant, your son, I come to you. Your beautiful scent, it calls me forward. I, your servant, your son, I come to you. and their two uraei have enclosed me. beautiful ma’at upon this day. I give you essential water, great gods, a tide in your time. I bring the flood waters to purify your sanctuary, great gods. Which has come from the Two Caverns. I come near you, O venerable gods. to be with you in this sacred place. I am one of you. My hatred is evil. So that we may live Glorious and Complete as the Eye. For as you live, I live. And as I live; you live. Homage to you NTRW who are Established upon Your Seats. You live off of her. You renew your youth when you see her. Ma’at rests upon your head. She is seated on your brow. Your right eye is ma’at. Your left eye is ma’at. Your mouth speaks ma’at. Your limbs do ma’at. She takes her seat within your ib. You are rejuvenated at her sight. I know you. I know your name. You open the noses of the living. You keep the gods alive. O Mistress of Protection, who protects the gods. I offer gifts to you, for I know your worth. The NTRW have peace and flourish through you, O Great Ma’at. Their hearts live when you rise before them. Rise O Mistress of Ma’at. Exist so that the gods may exist in peace and harmony. Take up position within every shrine of every NTR in every place of Your Domain. In all of your beauty. I am Thoth and I present ma’at to you Great Gods. My hands are upon her beauty before your face. Ma’at exists because you exist. And she exists before you forever. She is yours forever and ever, O Beneficent Gods. And as she is yours, she is the people’s. For as you live through her, your people live through her. For ever and ever, a million times effective. O Great NTRW, your enemies withdraw from you. The day dawned cold and wet this new years. I got up before the sun was even up and tried to get everything together for the rites that I wanted to conduct. I had made an attempt to prep everything the night before, but it never fails that the details slip through the cracks for me anymore. Being in the center of 3 other people whose needs and schedules can change quickly, and being a disabled person whose body tends to have its own plans on any given day, it became pretty clear to me before I had even uttered the first word of my ritual that I shouldn’t expect any of the plans that I make for my Year of Rites to be too rigid or concrete, otherwise I would be running headlong into disaster and disappointment. 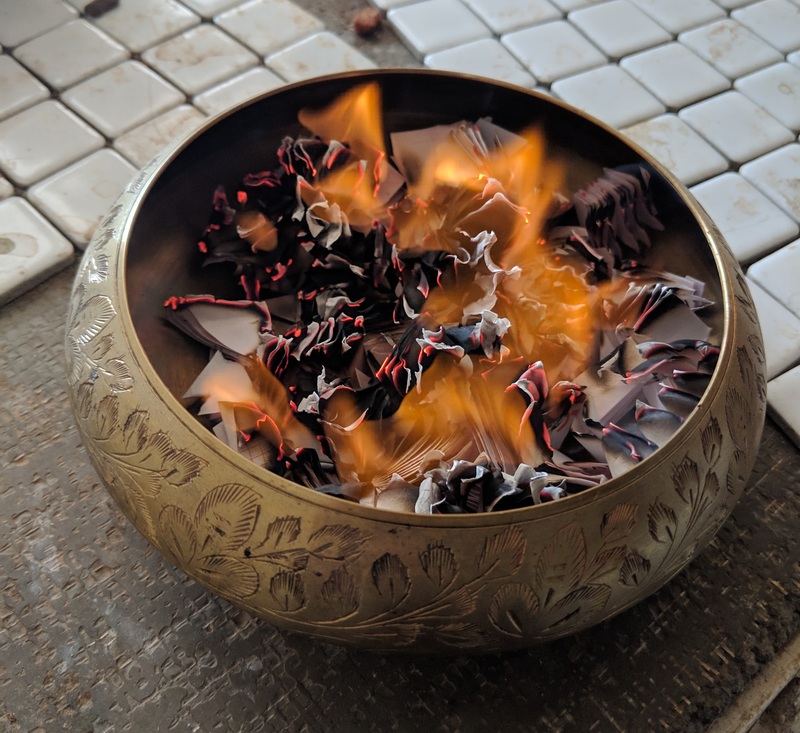 The first portion of the rite went with minimal issues, and if I could sum it up succinctly, it’d be “I said some words into a cabinet.” Both portions of the ritual I did could be summed up the same way. There is no amazing woo to tell anyone about because, honestly, nothing happened. At all. In that department. Over the weeks that led up to this, I kept being told that this year was not about Set and Osiris. 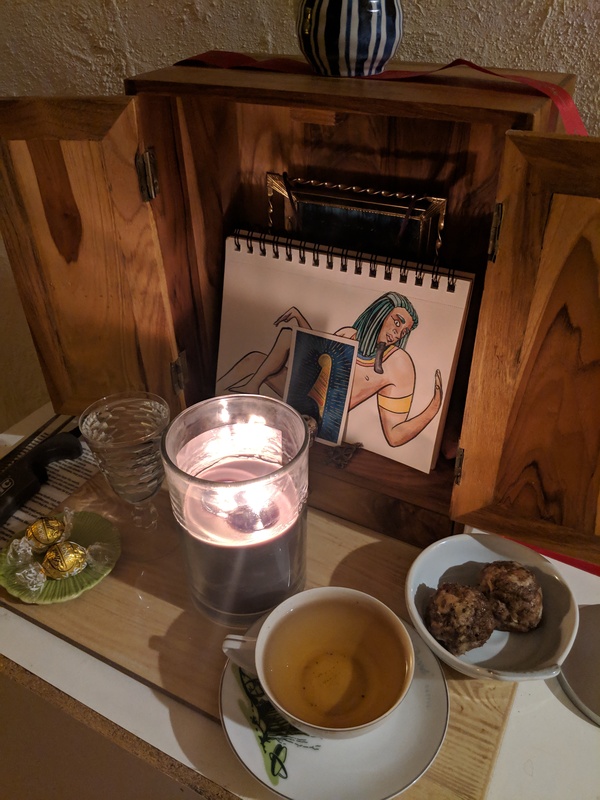 That it was about the entire pantheon, all of the NTRW, and so I decided to reconfigure the shrine for this year to reflect that. Set and O are sitting around among my other tchotchkes and I opted to make a flat image to use as an icon for this year. I wanted the background to hearken to the Nun, a place that I often see as a place for both death and rebirth. I chose to make the symbols in red and then layer over them with gold and blue. The redness reminding me of the vitality and vibrancy that is within our gods, regardless of how hidden it might become. And I chose to put them on a symbol for gold (nebu) for reasons that I don’t really understand except that it felt Right so I did it. While I originally had planned on doing the execration during the day and following up with part two in the afternoon, that schedule I mentioned shifted and I ended up doing the execration in the evening, as the sun set. As such, the second rite and subsequent offerings didn’t happen until well after the sun had set. 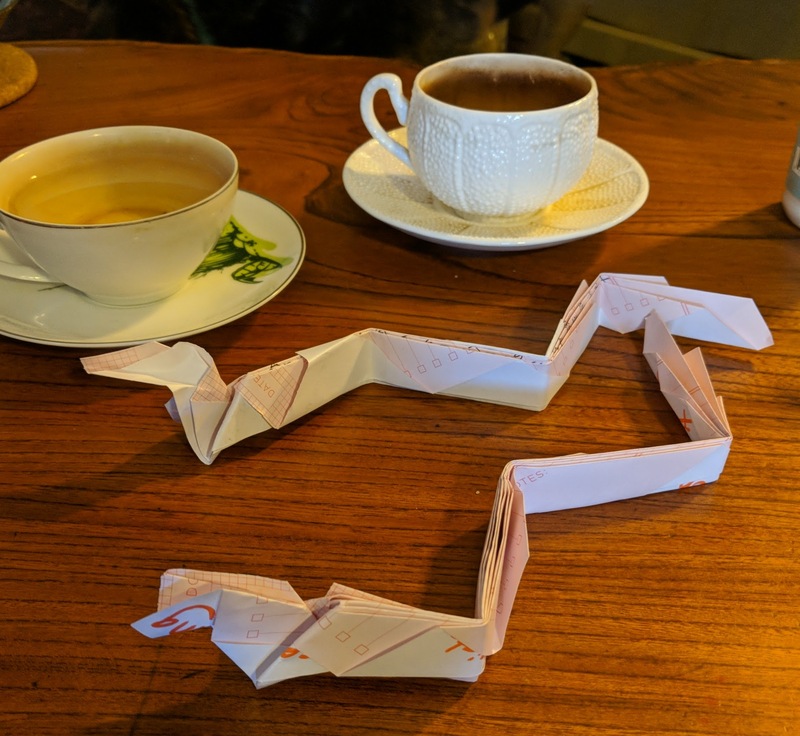 I was partway through my ritual when I remembered that I hadn’t finished my New Years Cloth offering… and so I had to make that while I left the gods to eat their offerings. I opted to use gold marker and I chose symbols that appeared on the illustration in the book, as well as symbols that I felt would be beneficial for the NTRW in the upcoming year. And of course, there are the four oranges. I also found myself really mulling over the fact that Zep Tepis aren’t always perfect or easily seen. 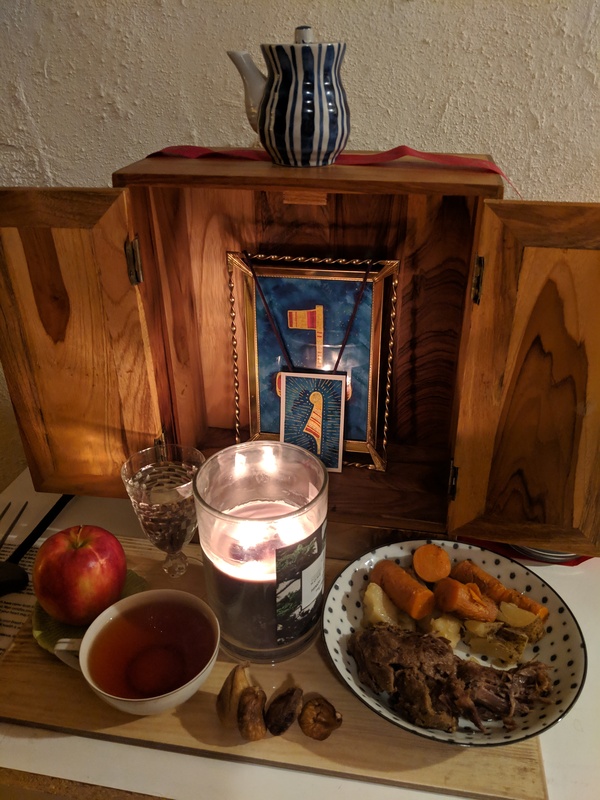 I wanted to be able to time my rites with the sunrise, to allow the sun to really drive home that things were starting anew, but then the clouds covered the sun until about 9am. But when its all said and done, does it really matter? Do I really need the symbolic Zep Tepi to know that I’ve started? It’s a lot like how most people approach New Years in general. Everyone waits for this symbolic restart, this symbolic date to decide to change themselves. And yet despite waiting for this symbolic date, most of us don’t actually see our changes through to the end of January. I wrote a long time ago about how your Zep Tepi could begin at any time, any place. That waiting for Jan 1 was not necessary, and in some cases, completely unhelpful because of the pressure it puts on you to be perfect straight out the gate. That the best Zep Tepis pass unnoticed in the very moment when we decide to start working towards something better. That change is not one singular Big Event that causes us to change everything about ourselves. That change is made in tiny, seemingly insignificant choices that can build up to Big Events later on. That the best changes happen incrementally, not overnight when the calendar resets and the year changes. While I was waiting for some sort of sign that symbolically signaled the changes we’re all undergoing, it became very easy to miss the very real fact that my Zep Tepi happened months ago. 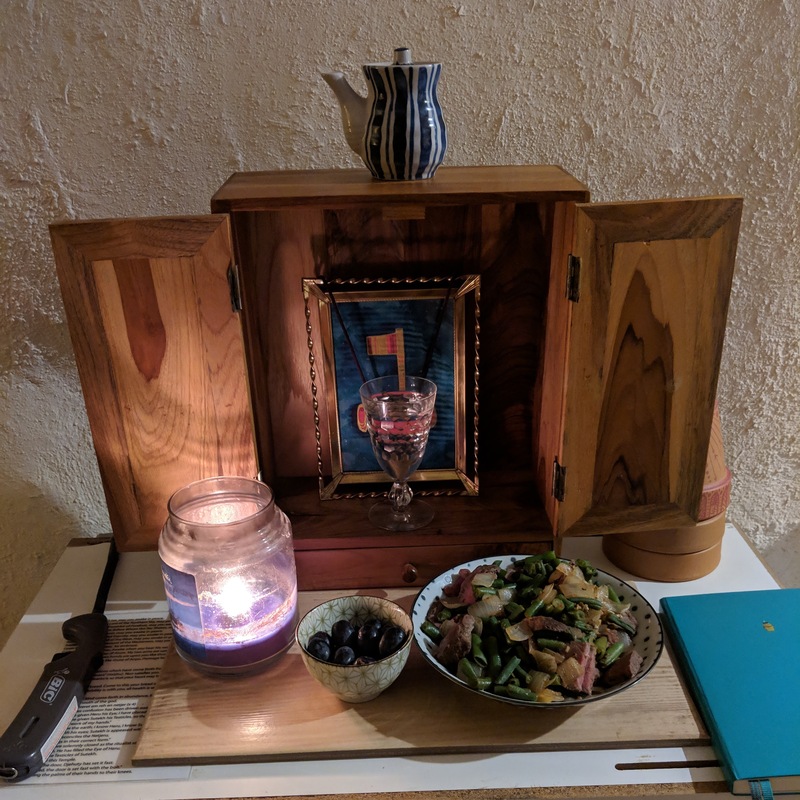 This Year of Rites didn’t just magically manifest overnight. I didn’t just wing my ritual. No, this has been in the works since August on some levels, since November on other levels, and since late December for the rest. 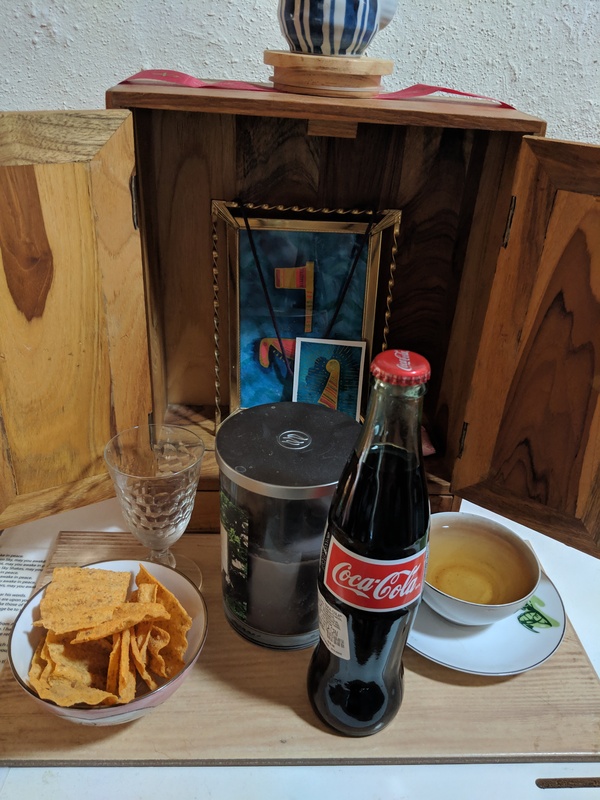 Just because I didn’t have some awe-inspiring moment in shrine didn’t mean that the work hadn’t been done, or that the work didn’t matter or bear fruit. Or as I wrote it in my log: Sometimes our Zep Tepi isn’t momentous. Sometimes it passes without notice. 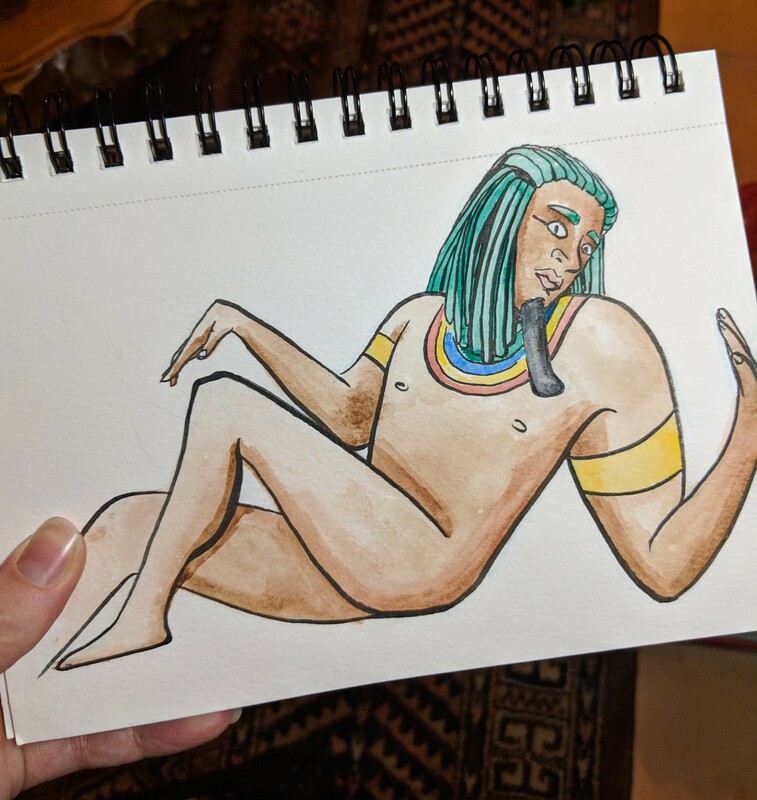 Its still important because any time we choose — consciously or not — to improve ourselves, we’re getting closer to ma’at, and that is the point in all of this. May all of your Zep Tepis in 2019 be amazing — noticed or otherwise. I’ve finally finished putting together the rubric for my first rite in the Year of Rites. Since I said I’d post any rubrics I made up here on WP, I’m posting this here for others to reference if they’d like! 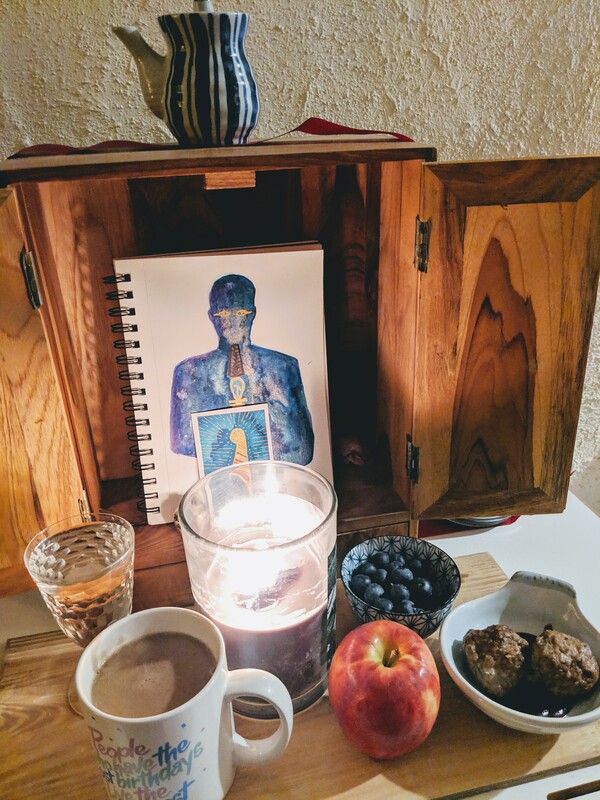 For this New Year, I plan on giving offerings around sunrise, since that’s when I make my breakfast. 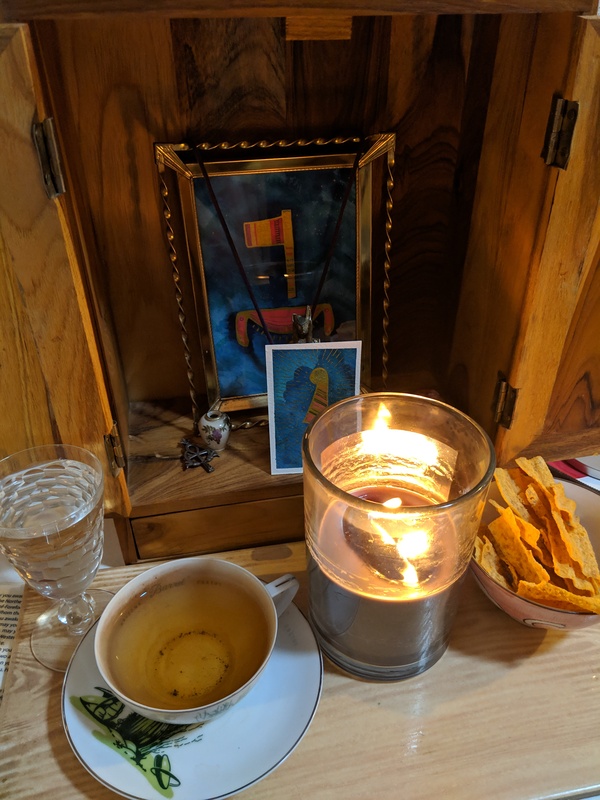 The first ritual will consist of opening the shrine, purifying the shrine with water, pouring libations, giving offerings, and using heka to build the NTRW a brand new body for the year of 2019. 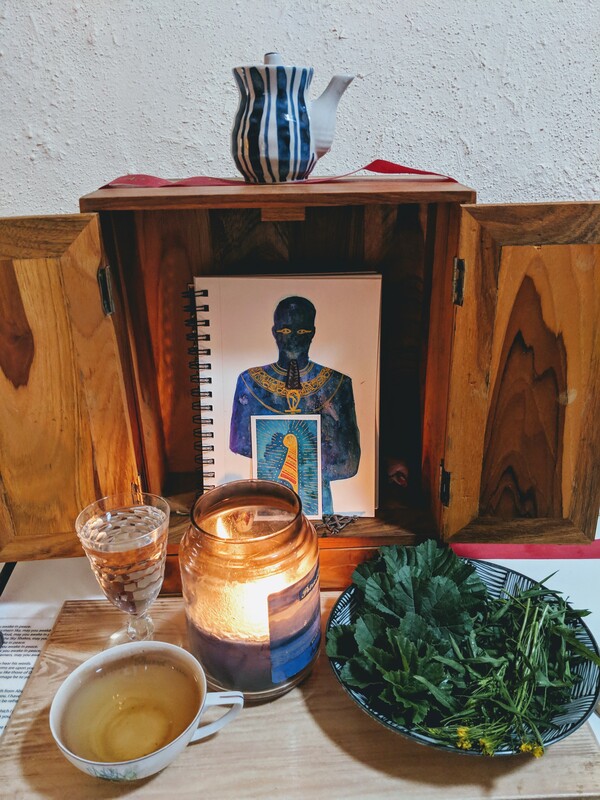 Later in the day I will be performing a red pot execration with a few other people, which I will then give a second round of offerings and recitations at the shrine afterwards to establish ma’at after the execration is done. The second half includes an offering specifically of oranges, because oranges are in season right now, and are highly associated with New Year for this part of the country. Oranges also have a very solar quality to them, which i felt was fitting for a New Years offering. If oranges are not on the docket, I recommend offering something in multiples of four, to keep the Four Pillars association intact. that I may present offerings to You that made them. And as I enter, rage goes forth. to make sound the Eye for its lord for this 2019. A new day has dawned, and with it, a new year. Conceived at night, born every day — a Zep Tepi is at hand. his eyes see all under the four pillars of the sky. Our light shines throughout the land. My attraction is the attraction of Khepri. Our attraction shines throughout the land. The primordial water that purifies this Zep Tepi. On the first Zep Tepi of this 2019.
so that you may Thrive in 2019. As this year is Renewed, so too is your body. See me as I give you your eyes, installed in their proper place. So that you see things hidden in the dark. On this morning of this Zep Tepi. Your throat to carry out its work. I lessen the voices of your enemies. I give you a brave heart to drive away enemies. A heart guided by ma’at, living off ma’at. so that you can strike down your enemies. so that you may have Authority. this servant, this sun, this Lord of Light. May your merciful face be towards me throughout 2019. May your face be green throughout 2019. As your face is green, so too shall mine be green. As green as a living reed. and see what I have done for you. your heart is glad to see it. I have driven back the rebels. I offer you this fabric, a pledge to receive a happy new year. I open the months of the year, its days and its hours. I make your house for you, under the sky and its four pillars. Enter. Take your place in this New Year. Your seat is firm, established for eternity.